We’ve been making small improvements to the existing system ever since the first one was shipped back in September of ’04. However, we feel the changes in this new machine bring it to a whole new level of streamlined operating performance. The new touch screen really changes not just the look but the way the operator interacts with this machine. – Mike Symcox, Service and Support Technician, Cask Brewing Systems Inc.
Touch screen programming – This is a much improved and simplified way for the operator to control the operation, cleaning, testing and set up of the equipment. Air cylinder adjustments – Cylinder speeds are now controlled more easily with air flow adjustments right on each cylinder for easier set up and adjustment on the fly. Clutch/Brake replaced with VFD control of seamer motor – Improved seam dimensions – the lower speed of rotation provides better control and reduced seam widths. Simplified electrical panels – The touch screen and improved I/O to the PLC allowed us to reduce the electronics into one stainless steel cabinet from the previous three. This makes maintenance and servicing much easier. Conveyor drive system – New system is direct drive so we’ve eliminated the drive belt to reduce maintenance issues and provide easier servicing. It has also been relocated to the back of the machine to keep the front of the machine open and easier to rinse off and clean. The ACS base unit is 10’6” length – An already compact system just got smaller and easier to fit into tight spaces. 24 oz cans – We’ve added 24 oz cans to the line up of can formats that this little machine will now convert between. Fill heads for different can formats will take minutes to change out. Improved flexibility – The ACS V3 can be converted in minutes to handle all can formats: 250 ml energydrink, 12, 16 and 24 oz cans as well as 500 ml European. Lid slide assembly – The lid slide tray is now fixed right to the frame instead of the conveyor rail. This improves its stability and also makes it much quicker to adjust the height for different can formats. 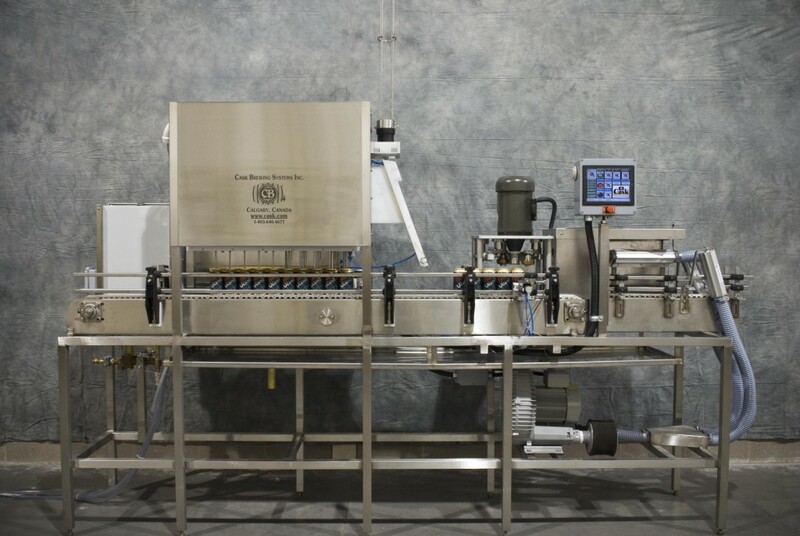 To learn more about Cask Brewing Systems’ affordable canning solutions for the craft brewing industry and small scale packagers worldwide, click here. 21st Amendment Named Best Canned Beer in America!